"MoDOT's Cable Median Barrier Program", a report from 2007. Cable median barriers, commonly referred to as guard cable, remain one of the most efficient roadside safety treatment available today. Guard cable consists of twisted wire ropes mounted on weak posts. It is relatively inexpensive to install, compared to more rigid systems, and has been proven effective at capturing errant vehicles. 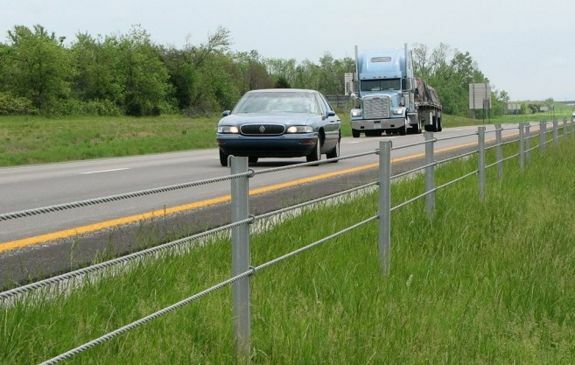 There are two types of guard cable systems in use on Missouri roads: low-tension and high-tension. 606.2.1.1 Low-Tension. Since no single producer exclusively manufactures low-tension guard cable, this system has been commonly called the “U.S. generic” system. Low-tension guard cables typically consists of three cables placed at different heights and are tensioned only enough to eliminate sag between posts. Large springs at either end of the cable run are compressed, according to temperature, to achieve the system’s low tension. The cable itself is strung on posts that are directly driven into the ground. When a vehicle impacts the low-tension system under normal conditions, the cable laterally moves as much as 12 ft. This movement is known as the dynamic deflection. Given the lack of tension in the system, individual installations, or “runs”, of cable are limited to 2000 ft. with an anchor assembly at each end. When a vehicle strikes low-tension cable, the system becomes disabled and will not function properly if subsequently struck by another vehicle. As such, it is critical to repair the guard cable promptly. Low-tension systems have been in service for some time and have proven their value by reducing cross-median accidents. However, the issues related to down time and the necessity to utilize on-call contracting cause a perpetual drain on MoDOT resources. For these reasons, the use of low-tension cable systems should be limited to small-scale installations with special circumstances. 606.2.1.2 High-Tension. High-tension cable barrier looks very similar to low-tension cable but the two systems are very different in most other aspects. High-tension guard cable consists of three or four pre-stressed cables supported by weak posts. During installation, the cables are placed on the posts and then tightened to a specific tension, ranging from approximately 2,000 to 9,000 pounds according to temperature. Due to this tightening, the cable installations can be of indefinite length. In fact, the runs are typically only limited by the presence of obstacles such as median openings or bridge columns. Under normal conditions, when a vehicle impacts the high-tension system the cable laterally deflects as much as 8 ft. The inherent tension within the system also allows the cable to remain at the proper height, even after an impact removes several posts. While the system is not designed to continue to function in that condition, there is a great deal of anecdotal evidence that it does just that. A common installation of high-tension guard cable employs concrete footings into which metal tubes are cast, forming sockets. The socket allows a post to be replaced with relative ease during a repair operation. The damaged post is simply removed from the socket and replaced with a virgin post. Socketed systems eliminate the requirement for specialized post driving equipment and subsurface utility location for each repair. A socketed, high-tension system should be chosen for large-scale guard cable installations. While such a system generally has a higher initial cost, the low cost and high efficiency with which it can be maintained make it a better value over its life cycle. A high-tension system incorporating socketed posts is easily repaired and maintained with the resources currently available to the district maintenance personnel. Additionally, high-tension systems can be used on a variety of median inslopes, often eliminating the need for costly slope corrections and drainage modifications. As of 2007, all high-tension systems are proprietary, that is, marketed under exclusive rights of a specific manufacturer. Five systems are currently marketed in the United States. Median guard cable is most effective when installed as a system-wide solution to address cross-median crash types. The benefits are severely limited if the cable is only used in spot locations in response to crashes at those locations. Additionally, when determining the most appropriate locations for guard cable application, the designation of a route (interstate, US highway, state route) should not be a primary consideration. A corridor should have similar geometry and traffic volume and the placement of guard cable on the corridor should have logical termini. Spot location installation of new median guard cable should be used sparingly only in unique situations. Analyses of cross-median crash history and traffic volume provide valuable information in determining the likelihood of future severe crashes on these routes. In order to prevent future fatalities and disabling injuries, it is important to focus safety efforts on locations that will benefit the most from safety countermeasures. 606.2.3.1 Crash Data. Analysis of crashes on a candidate corridor should focus on cross-median crashes on that route and, even more so, on those crashes resulting in fatalities and disabling injuries. It is important this data analysis is robust, particularly on expressways. Due to at-grade intersection crashes on these routes, a simple query of cross-median crashes may include unwanted events and exclude necessary ones. Accuracy of these data is vital in decision-making. The data should be reviewed each year to validate priorities and identify any emerging cross-median safety concerns. A regular review of divided highway traffic volume and crashes will provide information to proactively address severe cross-median crashes. 606.2.3.2 Traffic Volume. Recent research has connected traffic volume growth directly to cross-median crash events. As volume increases, the probability of a motorist crossing the median and hitting an oncoming vehicle also increases. Instead of relying solely on crash history, there is an opportunity to proactively address this crash type before the crashes occur by studying traffic volume patterns and installing a system of median guard cable on routes with sharply increasing volumes. 606.2.3.3 Median Width. Recent national experience has shown that cross-median crashes can occur on highways with median widths above MoDOT's initial 60 ft. threshold. Although this width has largely proven to be effective in detering such crashes, no route will be excluded from analysis solely on the basis of median width. Divided highways with very wide medians are expected to have little or no cross-median crash history, effectively removing them from consideration for barrier installation. Dynamics of Cross-Median Crashes. When a vehicle leaves the roadway and enters the median, certain predictable dynamics occur. Vehicles may enter the median at a variety of speeds and angles but for the purposes of roadside safety research and testing, a 60 mph departure at a 20° or 25° angle is generally used. Upon departure, a vehicle will initially continue along its vertical trajectory. As the inslope falls away along the 25° vehicle path, the vehicle effectively becomes briefly airborne. When the vehicle's inertia can no longer overcome gravity, it lands and its suspension is deeply compressed. As the vehicle continues to travel through the median, the suspension rebounds and the bumper of the vehicle stays at a relatively constant height throughout the remainder of the errant journey. Every guard cable crash is slightly different because of a host of site-specific factors. In general, however, the front of the vehicle must engage at least two of the three or four cables present in order to be contained by the system. Given the dynamics described above, lateral placement of the cable can be grouped into two main categories: medians wider than 30 ft. and those narrower than 30 ft.
Medians 30 ft. or wider. The guard cable should be installed no more than 4 ft. downslope of the edge of the shoulder. With wider shoulders, the downslope location could be less than 4 ft., but in any case, there must be 8 ft. between the barrier and the edge of traveled way. There are several advantages to this location but chief among them is the performance of the system in a crash. At the 4 ft. downslope location, the errant vehicle adjacent to the barrier, while airborne, is not at a great enough altitude to override the cable during a front side encounter. From the opposing direction, or backside, the suspension of the errant vehicle will have recovered enough to allow an impact to occur under relatively normal impact conditions. If the 8 ft. separation cannot be obtained, the designer must work with the Central Office Design Division to assess the potential safety impacts of a decreased deflection distance. If the arrangement cannot be proven reasonably safe, a different barrier system must be used. Medians narrower than 30 ft. In medians narrower than 30 ft., the guard cable should be installed within 1 ft. of the vertex of either a V or flat-bottomed ditch. As previously discussed, this location performs the most advantageously. The 4 ft. downslope location starts to fail in narrower medians as the suspension of the vehicle impacting from the back side (i.e. the opposite direction) is the most tightly compressed around that location. Again, a fully compressed suspension has proven to be the principal reason for vehicles underriding the system. Alternating Sides. The designer may choose to alternate the sides of the median where the barrier is placed for the purpose of reducing any shy line issues or discomfort for motorists. The change should occur at natural breaks in the barrier such as emergency crossovers or median bridge columns. Lateral Placement of Low-tension Guard Cable. New installations of low-tension guard cable should be installed within 1 ft. of the vertex of either a V or flat-bottomed ditch. Retrofits should be located at the existing offset, provided the system is functioning well. In-service experience with parallel installations has shown less than desirable results. The close proximity of each installation to traffic has caused an inordinately high incidence of nuisance hits resulting in higher than acceptable long-term maintenance costs. Vegetative maintenance is also a concern. Parallel installations of guard cable should not be used. Instead, designers should rely upon guard cable designed for the situation as a single run or consider a barrier system other than guard cable. While guard cable has been tested and approved with post spacing ranging from 6.5 to 32.5 ft., it is widely believed that the wider post spacing leads to greater deflections and an increased likelihood of vehicle penetration due to underride or traveling between the cables. For this reason, post spacing should not exceed the conventional limit of 20 ft. Additionally, increasing post spacing through horizontal curves increases the opportunity for the cable to assume a chord length if the posts are damaged. If enough posts are damaged, the cable could project into the travelway on the inside of the curve. 1V:6H (6:1) or Flatter Slopes. Guard cable, like most roadside hardware, is intended for use on slopes that are 1V:6H (6:1) or flatter. This requirement is based on both computer modeling and full-scale crash testing and represents sound theory. In practice, however, slopes as flat at 1V:6H are often the exception. Steeper Slopes. All of the proprietary high-tension systems are now approved for use on slopes with gradients between 1V:6H (6:1) and 1V:4H (4:1). Their use, while generally more expensive, represents the most cost-effective solution for shielding steeper slopes. Further, since more than three equivalent sources exist, there is no need to obtain a material certification for their use. Vegetation control in the area between the cable and the passing lane must be addressed. Failure to provide some positive form of vegetation control will hinder the future maintenance of the system. Positive vegetation control measures may include herbicides, a geotextile-aggregate strip or asphalt apron. The core team must consult with the local maintenance personnel to arrive at a vegetative control measure that is mutually agreeable. A district's decision to mow around the barrier must be approved by Central Office Maintenance. Such mowing operations must be accomplished without impeding through traffic in any manner. Vegetation control may not be omitted from a project as a practical design or value engineering measure. The design for guard cable termination as well as the grading for the crossover should be in accordance with Standard Plan 606.41, Sheet 7 of 7. Refer to EPG 240.4 Guard Cable Termination at Emergency Crossovers for additional information. Irrespective of routes treated, proper placement or system used, cable median barrier is only as functional as its ongoing maintenance and repair. Proper maintenance and incident repair will ensure that the system is always in a state of functionality to provide motorists a greater level of safety on Missouri highways. Routine Maintenance. 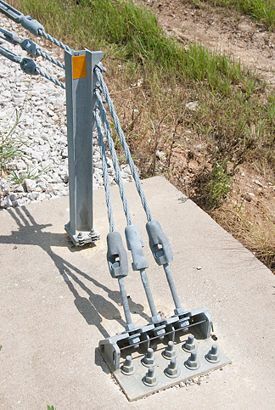 Outside of vegetation control, there is little routine maintenance required for a guard cable system. If pre-stressed cables are used for high-tension systems and compensators are properly compressed for low-tension systems, the tension in the cable should properly acclimate to any weather condition. The tension monitoring stage occurs during and shortly after construction. Cable Height. The importance of cable height to properly capture and redirect errant vehicles has been demonstrated. Although cable height is relatively static in all systems, erosion under the barrier can sometimes cause a localized increase in height, resulting in possible underride. Maintenance personnel should be educated on the necessity of proper cable height and encouraged to identify and repair locations where erosion or the accumulation of silt have altered the relative cable height. Median Condition. A secondary issue, closely related to incident repair, is the post-entry condition of the median. In addition to the repair of the roadside hardware, the median condition with respect to rutting, loss of vegetation and accident debris should be remedied following each accident. These incidental concerns could cause instability in the trajectory of future errant vehicles and could, at worst, result in a failure of the system. Low-Tension Cable Barrier Repair: On-Call Contract. Maintenance of low-tension cable barrier is vastly more complicated than that of a high-tension system. In fact, the complexity of the system coupled with the frequency of crash incidents, have traditionally resulted in the system’s maintenance being outsourced through on-call contracts. High-Tension Cable Barrier Repair: In-House. Equipment and hardware needs for the repair of high-tension, socketed guard cable are minimal and repairs can generally be accomplished in under an hour with two workers, some hand tools and a pickup truck. Response Time. Due to the importance of the median guard cable performing when needed, it is vital to quickly respond to repair needs. This will often necessitate an effort to identify cable hits as soon as possible after the incident and then respond with repair as quickly as possible. See Maintenance Planning Guideline for Guard Cable. For Sec 606.50.2. The embankment slope between the shoulder and the guard cable should be 1V:6H (6:1) or flatter, unless the system is approved for use on slopes as steep as 1V:4H (4:1). If only one run of three-strand guard cable is installed in the median, the slope on both sides of the guard cable should be 1V:6H (6:1) or flatter, unless the system is approved for use on slopes as steep as 1V:4H (4:1). No exceptions should be allowed unless approved by the Central Office. This is essential for the guard cable to perform as designed. The embankment slope behind the guard cable is not critical (may be as steep as 1V:2H (2:1)) if another run of three-strand guard cable is installed on the other side of the median to protect crossovers from that direction of traffic or if adequate clear zone is provided in the other direction of traffic. Such "double runs" are discouraged, however, since both the initial and lifetime costs are doubled. Aggregate Bedding (for Sec. 606.50.2.4). Having a predominantly one-sized stone as a bedding material for guard cable, as currently specified in Sec 606.50.4, will act as marbles when a vehicle impacts the bedding material and will likely result in an impacting vehicle to dive under the cable system and continue across the median into the opposing traffic, thereby defeating the purpose of the guard cable system. This is elevated to even a larger safety issue where contractors have provided sand or gravel as the bedding material, which have a greater tendency to roll like marbles when impacted and increases the probability for a vehicle to dive beneath the barrier system. In the interim of getting a specification revision, existing jobs should be change ordered to a bedding material consisting of a uniform, angular graded material of a gradation similar to that shown below. Verification of the gradation should be accomplished by visual inspection, and when in suspect, a sieve analysis should be conducted. Delineators (for Sec. 606.50.2.5). All three-strand guard cable, regardless of the location of the guard cable, should be delineated, with delineator spacing, reflective sheeting and reflector colors in accordance with Sec 606.10.2.3. This page was last modified on 28 September 2018, at 13:50.